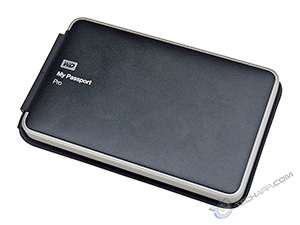 Western Digital has a wide variety of external storage products for both the PC and Mac markets. The external drives are available in both large desktop and smaller portable formats. Under the portable segment alone, Western Digital offers three drive families for the PC, and four drive families for the Mac. Durability and professional style - The dual drives in My Passport Pro are housed within an anodized all-aluminum enclosure that complements your professional style. With WD drives inside that meet our demanding requirements for durability, shock tolerance, and long-term reliability you can enjoy peace of mind knowing your creations are protected. So whether you're filming a new documentary out in the field and shipping your latest footage back to the studio, or presenting your new portfolio to a client, My Passport Pro is designed for any on-the-go workflow. Keep your creativity moving - Shipped in RAID 0 for maximum speed and capacity, My Passport Pro helps you edit and compile without skipping a beat. Your workflow keeps moving as fast as your imagination. Protect your livelihood with RAID 1 - Your work is your life. Protect it with RAID 1 mirror mode for double safe data protection. In this mode, the capacity is divided in half so that one half stores your data and the other half maintains a duplicate copy. No power adapter required - Powered directly through the Thunderbolt port on your MacBook, My Passport Pro frees up space in your field kit by eliminating the need for an AC adapter. And with the integrated cable that is tethered to the drive, you'll never lose your Thunderbolt cable on location. Works with Apple Time Machine - Once you've captured you images, protect your creative masterpiece with the fast and easy backup of Apple Time Machine. Blazing fast boot drive - Store your system files on this drive and use it as a blazing-fast boot drive so that when your deadline is looming your computer won't slow you down. Plug-and-play setup - My Passport Pro is preformatted HFS+ J, so it’s ready to use with Mac OS straight out of the box. Ready when you are - WD Diagnostics performs a S.M.A.R.T status check on your drive in seconds so you know it's ready to go when your next job comes up. Now, let's find out how this new portable hard disk drive fares against its competitors!